This game is about Melvin the Missionary. He's in war-torn Africa to try and recruit into the Church. The only snag is, he's stuck in a series of increasingly difficult minefields - and he has to cross them! Luckily he has his handy mine detector, that tells him how many mines are next to him. Unfortunately, it doesn't say where they are. Help the man to cross the minefield and get to safety. Each new level will have more mines. 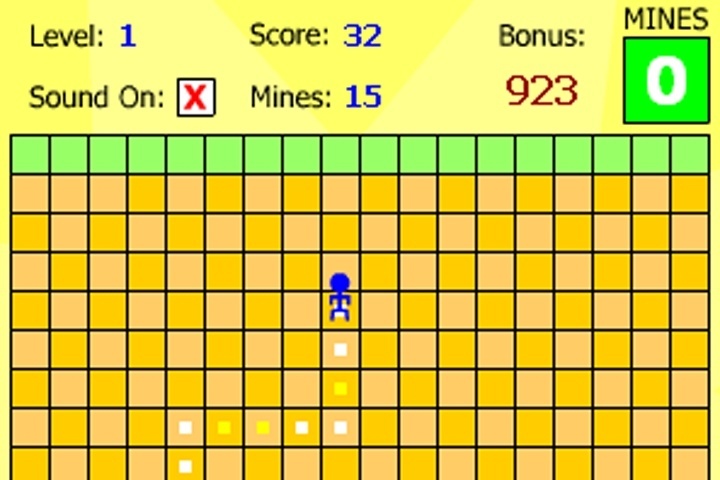 Guide Melvin across the minefields, from one safe zone to the other (safe zones are green) by using your cursor keys. You can only move Up, Down, Left, and Right. If you want to play Mined Out games online you have come to the right place! GamesLoon adds new Mined Out games every week. This is your game portal where you can find the biggest collection of free Mined Out games online. Do not forget to rate our Mined Out free online games while playing!